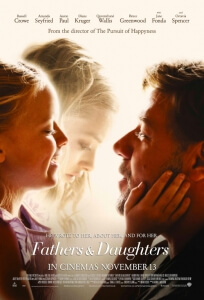 With a cast like the one you see above, you have to wonder why Fathers and Daughters was pretty much swept under the rug over a year after it finished filming, with only a minor release in the UK and across Europe without much hullabaloo about it (currently, it doesn’t even seem to have a US release date in mind). And then you actually watch the damn thing. Then, and only then, will you realise what a kerfuffle it really is, with some of the hokiest direction, acting, editing and especially writing you’ll likely see all year – and given the stuff we’ve sat through over the past couple of months, that’s saying a lot. The film is structured – or meant to be, anyway – with two parallel stories concerning, what else, fathers and daughters. The former, a Pulitzer Prize-winning author played by Russell Crowe (yeah, we can’t see it either), is struggling with severe mental illness after a car-crash kills his wife, including several abrupt and genuinely upsetting episodes of seizures, while also trying to support his young daughter Katie (Kylie Rogers), who’s being eyed by her “eeeeevil” rich aunt and uncle (Diane Kruger and Bruce Greenwood) for adoption. Flash-forward twenty-five years later, and Katie (now looking like Amanda Seyfried) is a young psychiatrist whose “self-destructive tendencies” – she says that in actual lines of dialogue meant to resemble casual conversation – and lack of empathy lead to a series of one-night stands with no emotional attachment. That is, of course, until she meets young aspiring writer Cameron (Aaron Paul) and, whaddyaknow, falls in love with him, and from there a whole bunch of crazy only-in-Hollywood contrivances happen all at once. We’re just going to come right out and say it, this might be one of the worst scripts we’ve seen being performed this year, based on its storytelling and characterisation alone. This is writer Brad Desch’s first screenplay, with no other credits listed on his IMDb page, and boy can you tell: it relies way too heavily on clichés as a crutch to help it get through scenarios where those clichés aren’t even necessary, and it’s filled to the brim with some absolutely atrocious dialogue that the stranded cast is forced to deliver (the line we mentioned earlier as uttered by Seyfried is just the tip of the iceberg). It’s the kind of script that seems to exist in its own nonsense universe, consisting of things that only desperate writers eager to leave a mark would come up with, whether it’s the forced threat of a custody battle with reasons far too stupid to sum up in this review, or even an act of betrayal that literally comes out of nowhere and is meant to make us sympathise with them due to their struggle but only makes us hate them even more than we already do. Narratively, Desch constantly wobbles from one tonal shift to another; we could be focusing heavily one moment on an intense confrontation between Crowe and Greenwood’s evil-because-evil uncle, and the next we could slap-bang in the middle of another much lighter confrontation between two other characters. On that note, the sudden jumps forward in time become uncomfortable when we see a young Katie one moment being so innocent and chirpy as children are seen to be, and then seeing the adult Katie casually banging some poor sod in a college bathroom. That’s probably more on the editor and director than perhaps the writer, but even if these two separate stories were shown in chronological order it would still be a jarring narrative to follow because it is so convoluted and contrived that it’s hard to really focus or care about anything other than how unapologetically awful and manipulative it can get. It’s also shocking how badly written these characters are, whether they’re just given the most basic of stock movie characters – Greenwood and Kruger’s parts feel like they’ve actually been ripped from a pantomime, they’re so over-the-top in how despicable they are – or just passing by while having little to nothing to do with the actual main plot, in particular Quvenzhané Wallis as a mute girl suffering from trauma whose role seems to be to add to the already manipulative feel to the whole thing. Katie, in particular, is a horrible person when you really start to examine it; as a child, she’s constantly taking her loving father for granted to a point where she becomes insufferable, despite Crowe’s constant hard work in order to support her (he, by the way, is the only character we come close to sympathising with in this whole movie), suddenly loses all empathy and respect for her father based on incidents that aren’t even his or anyone else’s fault, and even as an adult struggles to settle with Paul’s completely-decent boyfriend character, even going so far as doing something terrible that really is entirely her fault, and expecting people to forgive her for it in the end. It’s a terribly written part that makes even Bella Swan feel embarrassed to be a part of the same gender, and the film ends on a frightfully misogynist moral that just dismisses her awful behaviour as “just a chick thing” (not an actual quote, thank God), when we all know that women in general are so much better than this. The worst thing, however, is just how much director Gabriele Muccino is convinced that everything in this script is considered the Second Coming and should be treated as such; from the ham-fisted and overly-dramatic direction he gives to a cast of talented actors, who all sadly underwhelm here because of it, to the way he stages certain scenes in supposedly Birdman-style single takes when they’re not even necessary, this is a sign of some serious directorial arrogance this side of Shyamalan. Gabriele, you may have directed Will Smith to an Oscar nomination with The Pursuit of Happyness, but you also made Seven Pounds; you’re not a miracle worker, no matter how convinced you may be that you are. Like we said, this is a genuinely fantastic line-up of actors here who have all given great performances at least once in their careers, but their work here is absolutely not their best and we think it really is to do with the self-importance of both the direction and the abysmal screenplay that they have to work with. Those two combined elements make this a truly insufferable film to sit through, and it’s very likely that you’ll be seeing Fathers and Daughters again at some point during out Worst of the Year list. Fathers and Daughters is one of the worst-written films of the year, with Brad Desch’s screenplay filled with plot contrivances, dreadful dialogue and unlikable characters coming to a frightfully misogynist moral by film’s end, while Gabriele Muccino’s direction is aggressively self-indulgent, wasting talented actors as mere puppets in a story that has no business in being a story in the first place.